From Spaces to WordPress step by step. Give yourself a new header. 12. Adding a Custom Header. 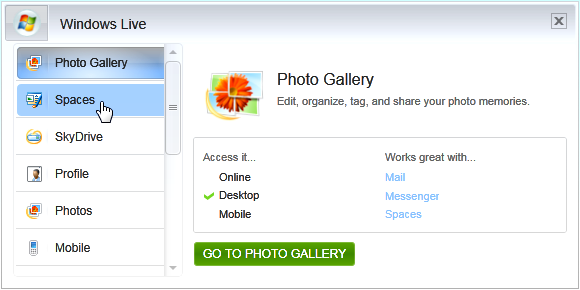 One of the features often requested on Windows Live Spaces was the ability to add your own header to your Space. On WordPress, most of the available themes allow you to do just that, so this how-to takes you through how to add your own header to your blog. To illustrate how to add a header, I’m going to use my testing blog on here which at the moment is using the Elegant Grunge theme. To tie in with that theme, I am going to add a Grungy type header so first of all, I need to grab a free background that is both darkish and grungy. I do this by simply doing a search using either Bing or Google to find that type of background to use for my header. Live Photo Gallery v Google Picasa round 3. 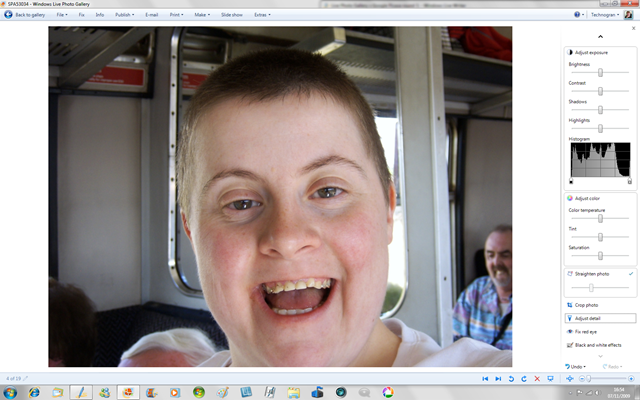 More extensive editing in Picasa. In this post I intend to take a look at the more intensive editing features contained in both of these two free desktop photo editing programs. . 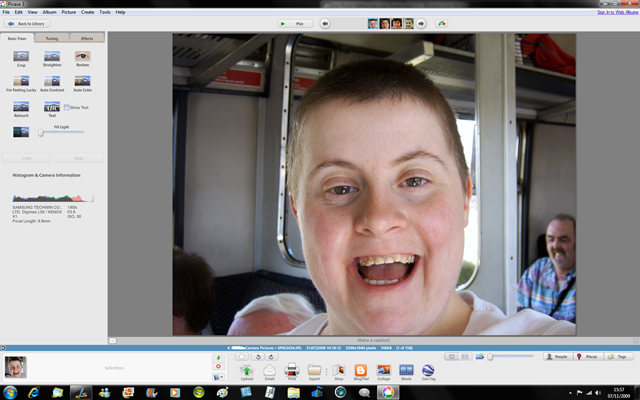 Looking at Picasa first, it’s editing sidebar which is placed on the left hand side of the photo screen is divided into three separate areas or tabs. These consist of Basic Fixes, Tuning and Effects. Basic Fixes contains clickable icons for Crop, Straighten, Redeye, I’m Feeling Lucky (auto fix) Auto Contrast, Auto Colour, Retouch, Text and Fill Light. Only Fill Light has a adjustable slider. The Redeye feature in Picasa is particularly impressive because even if the person who is affected by the redeye is some distance away in the photograph, Picasa can still enable Redeye correction and it automatically draws a green square around each affected eye so that all the user has to do is to click on Apply. Two features which are included in this category that are not available in Photo Gallery are Retouch and Text. As the name implies, Retouch allows the user to touch up someone’s face in order to cover up any blemishes for example by brushing it out. You can choose which size of brush you wish to use and then by clicking the circle above the blemish you can cover it, and then click on Apply. You are able to ‘undo’ the patch or cover if you are not happy. The text feature allows you to place some text into the photograph. You can choose which font and size of font to use and also its alignment and its transparency. The middle tab Tuning consists of four separate sliders for Fill Light, Highlights, Shadows and Colour Temperature to enable you to ‘fine tune’ the photograph. All can be reversed with Undo Retouches. The last tab Effects features all the different Effects that you can apply to your photo shown as small icons consisting of that particular photo so that you can easily see just how each effect will look when applied to the photograph. 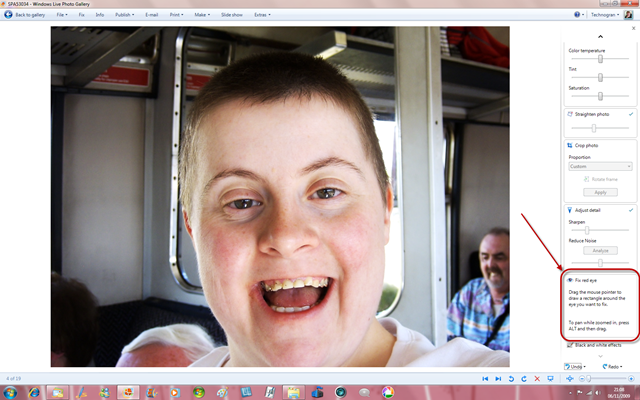 So Picasa contains some quite extensive editing features considering that it comes entirely free to use. More extensive editing in Photo Gallery. 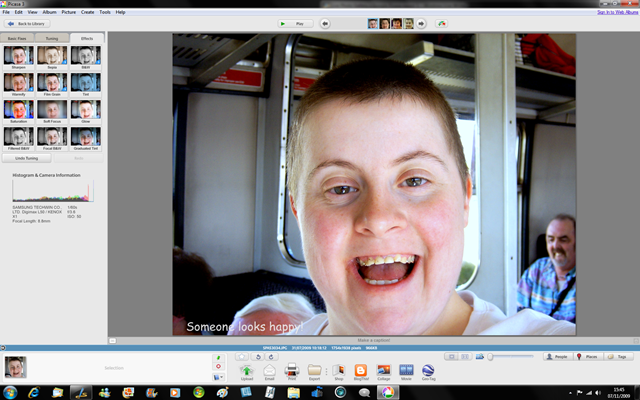 In direct contrast, the editing column in Photo Gallery is placed on the right hand side of the photo editing screen. 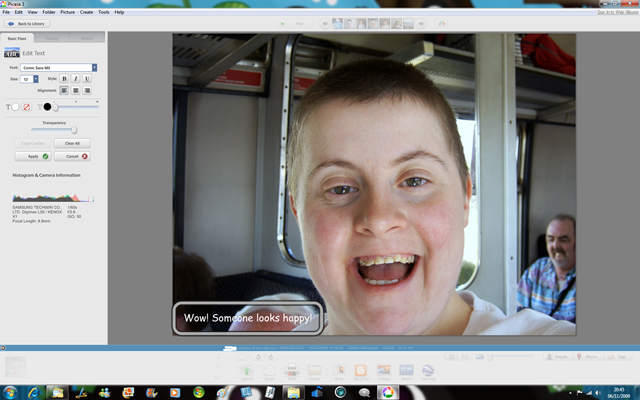 It’s editing tools make far more use of sliders in order to adjust each feature. They consist of the following, Auto Adjust, Adjust Exposure, Adjust Colour, Straighten Photo, Crop Photo, Adjust Detail, Fix Red eye and Black and White Effects. With the adjust exposure feature as well as sliders for Brightness, Contrast, Shadows and Highlights, you also have a Histogram so that you can see how your adjustments look. 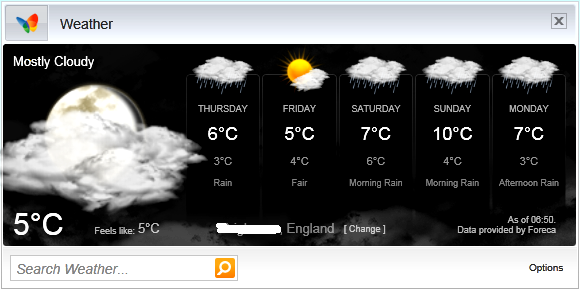 The Adjust colour also makes use of sliders for Colour Temperature, Tint and Saturation. When you click on Straighten photo, a grid is overlaid on top of the photograph to assist with lining up any vertical or horizontal lines in that photo. Crop photo allows you to crop out any areas that are superficial to the photo and both of these features also work exactly the same in Picasa. The Adjust detail feature is relatively new to Photo Gallery and was added during the last updates. It allows you to Sharpen up your photo by using a slider. Firstly as soon as you select Adjust detail, the photo is ‘zoomed in’ so that you are more able to see the close up affects of your sharpening, then because applying any sharpening usually introduces ‘noise’ into the photo, you can click on the Analyze button to reduce the noise that may have been introduced during the sharpening procedure. I have found that this feature works quite well. 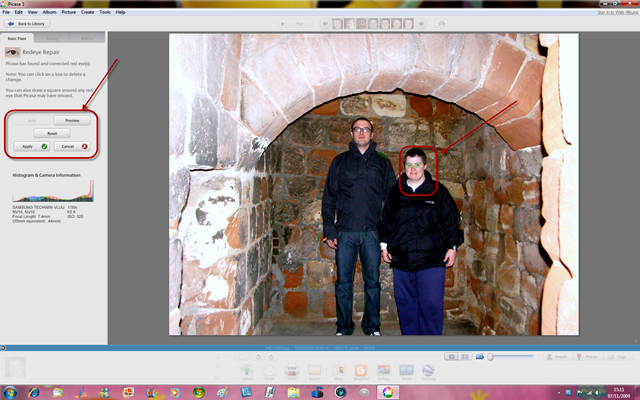 The Fix red eye in Photo Gallery does not work in the same way as the same feature in Picasa. 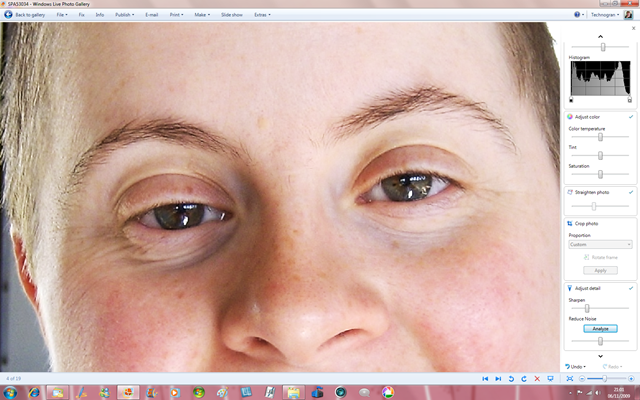 Instead, the user has to manually drag the mouse pointer around the effected eye instead of the program automatically drawing a rectangle for you, and so whilst it is fairly easy to do if the affected person was fairly close to the camera when the photo was taken, it is not as useful if the person was stood quite a distance away. However, one could argue that its harder to spot the incidence of Redeye if someone is a further away. 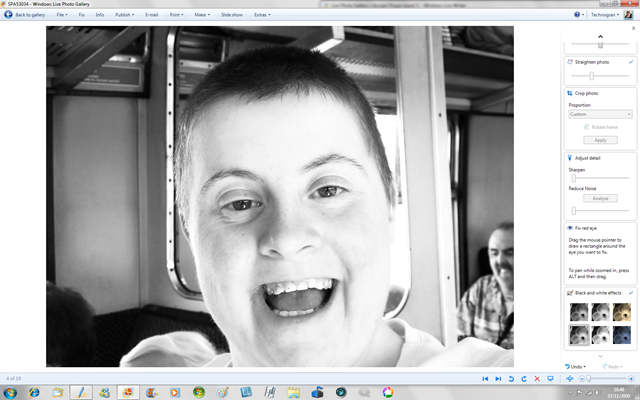 The Black and white effects in Photo Gallery also are shown as small icons displaying their effects, but not of that particular photo, so the only way to see just how they look when applied to your photo is to click on them and try them out. All adjustments made to any photograph can easily be undone by clicking on the Undo button at the very bottom of the Edit column. In the next round between these two programs, I intend to focus on any extras that either program provides such as the Panoramic feature incorporated into Photo Gallery and the Collage feature and the Geotagging that is available in Picasa.